The HTC Sensation 4G has picked up a large following among cell phone fanatics with many wanting the handset to be their next smartphone. We recently showed you a video made by HTC that details all of the features on the device. First of all, HTC Sense 3.0 is on board with Android 2.3 underneath. The new version of Sense allows you to receive information from your lock screen, reducing to zero the number of clicks required to see information important to you. 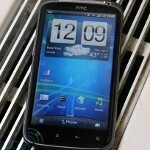 Speed is of the essence with the HTC Sensation and the dual-core Qualcomm 1.2GHz processor points that out. Transitions present 3D style animation, similar to what HTC put on its Flyer tablet. The Super LCD display is 4.3 inches with qHD resolution and contoured glass to prevent scratches. The 16:9 aspect ratio lets yopu watch movies as they were "intended to be seen". A .3MP VGA camera on front allows for video chats and self-portraits. One of the most talked about features on the HTC Sensation 4G is the 8MP camera on the back of the unit. The camera takes a picture the instant the shutter is snapped with no lags. There is a dual-LED flash and video is captured in full HD at 1080p at a 30fps rate. 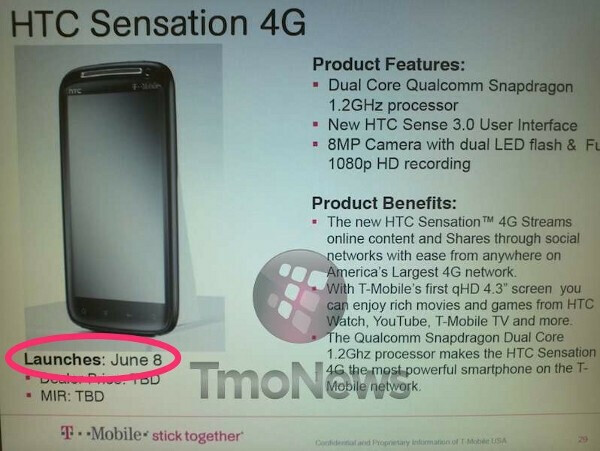 A leaked internal T-Mobile memo from a dealer shows that the HTC Sensation 4G is expected to launch June 8th by the carrier. No pricing details were revealed. Yesterday we reported that Target will be offering the model for $199.99 with a 2 year contract and could be gearing up for a June 12th launch for the phone. It's DUAL lcd flash, not duel lcd flash. It's "dual-LED" not duel or LCD. How does it compare to the G2x? One of the best Andeoid phone and the best 1080p video with zoom. I swear if Samsung doesn't give a solid US release date for the Galaxy S2 by the time this thing drops, I'm going with the Sensation. This waiting is really starting to get on my nerves (oh, how I wish I were a patient man). I've been needing a new phone since January and it took every fiber of my being not to settle for the G2X (I want larger screen). I don't think I'll be able to pass this up, especially since I know for a fact that I can stay with T-mobile with this phone. the galaxy s2 has only launched in europe T mobile will be getting the samsung Hercules but not until around Q3 :( sorry to burst the waiting around bubble but trust me when I say the Sensation will be an amazing phone! I will never, ever own an HTC phone again. HD7 was the second worst phone I've owned (the first being a sidekick ll). My g2x has been the best phone so far. I also liked the galaxy s 4g, but the dual core g2x drew me in. GERIKO--- Your right HTC is a crap brand... Theyre only the #1 brand provider in the US and Europe and about to Launch in CHINA and take over as # 1... maybe try switching different devices? maybe an android HTC was a better fit over a windows phone?